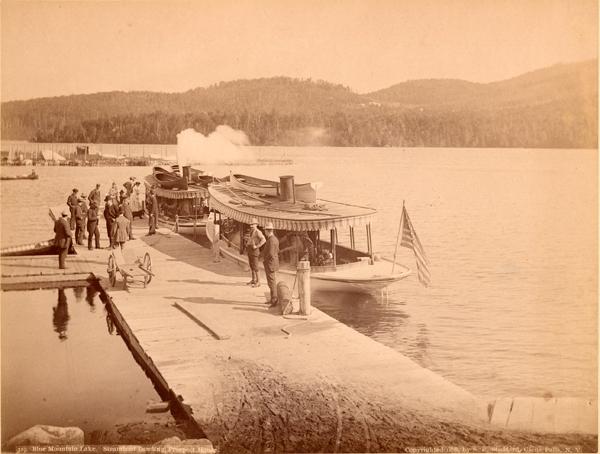 Whenever I view old photos of steamboats in the Adirondacks I almost always see guideboats in the photo. Why is that? What is the connection between the two? Well let’s see what role steamboats played in the the history of the region and see where that leads us. Steam power caused a revolution in the development of our nation. Travel by train opened large areas of previously inaccessible territory. Now, many could afford to travel to wilderness areas like the Adirondacks. Railroad tycoons like the Durants seized on the opportunity to capture this new source of revenue by expanding their network of rail lines. 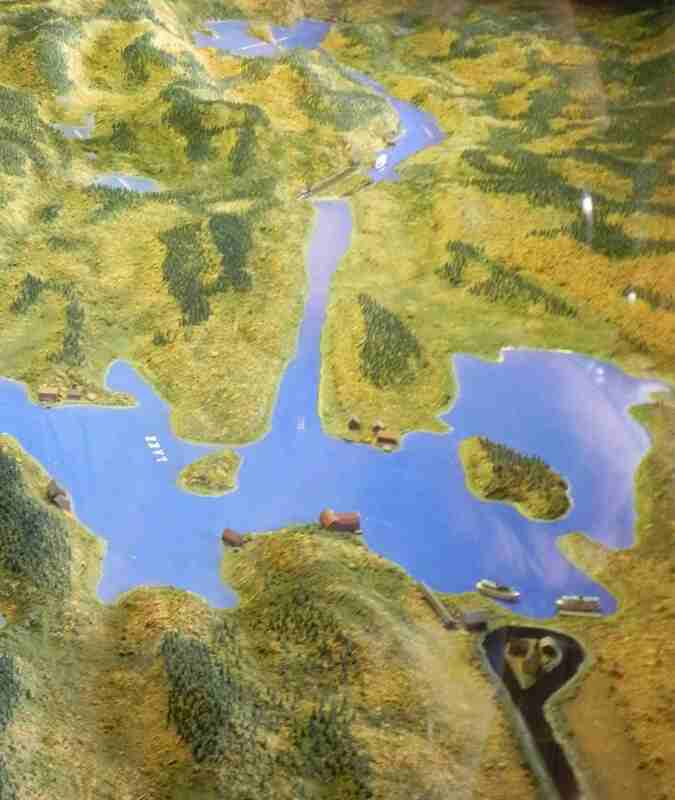 There is a fascinating diorama at the Adirondack Museum that cleverly depicts how the steam revolution shaped the history of the Adirondacks. 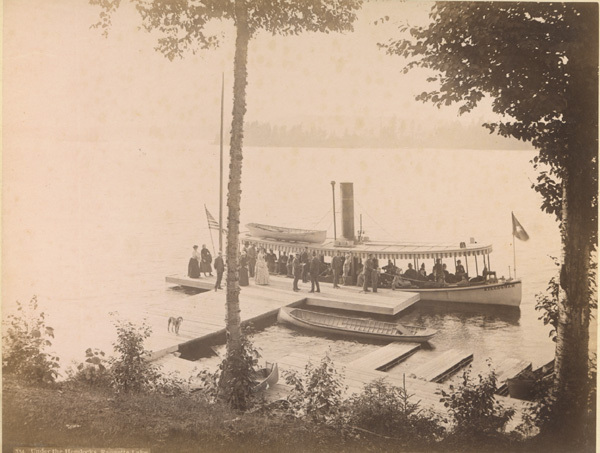 To travel to Raquette Lake from New York City, travelers boarded the New York Central train at Grand Central Terminal in the evening. Sleeping cars were provided since the train would not arrive at the destination until the next morning. The New York Central train arrived at Old Forge, NY in early morning when it was switched to the Raquette River Railroad which went on to Raquette Lake. The heavily loaded train pulled these cars over steep grades until they arrived at the Raquette Lake terminus. On weekends the arrival was delayed some three or four hours because of the extra sleeping cars required to carry all who had bought tickets. The photo below is taken of the diorama. It shows two steamboats waiting to take travelers to their lodging after they have had breakfast in the terminal. 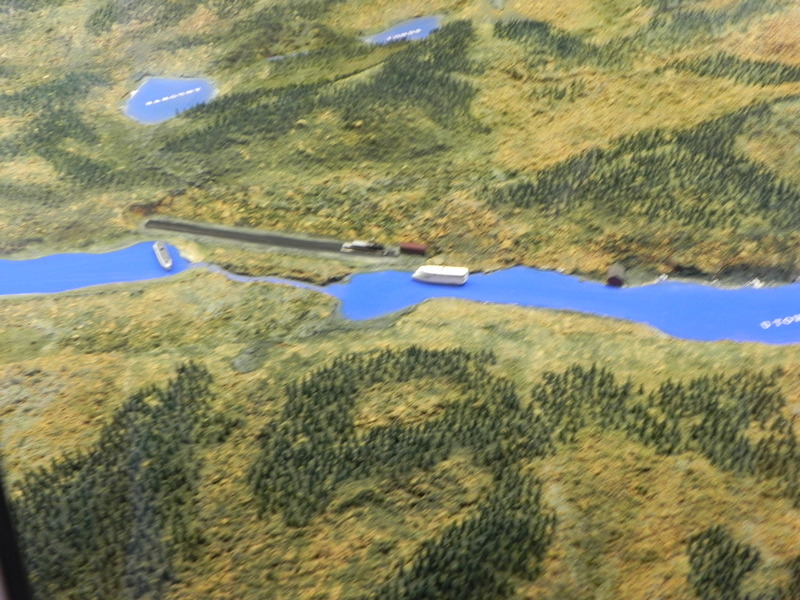 View of the diorama’s depiction of a portion of Raquette Lake with the railroad terminal in the foreground. The two steamboats waiting at the terminal are the Kiloquah and the Sagamore. The Sagamore has a green guideboat on its upper deck. In the diorama, the Kiloquah steams off to the Antlers Hotel on the point and then east up the Marion River which is almost directly across from the terminal. 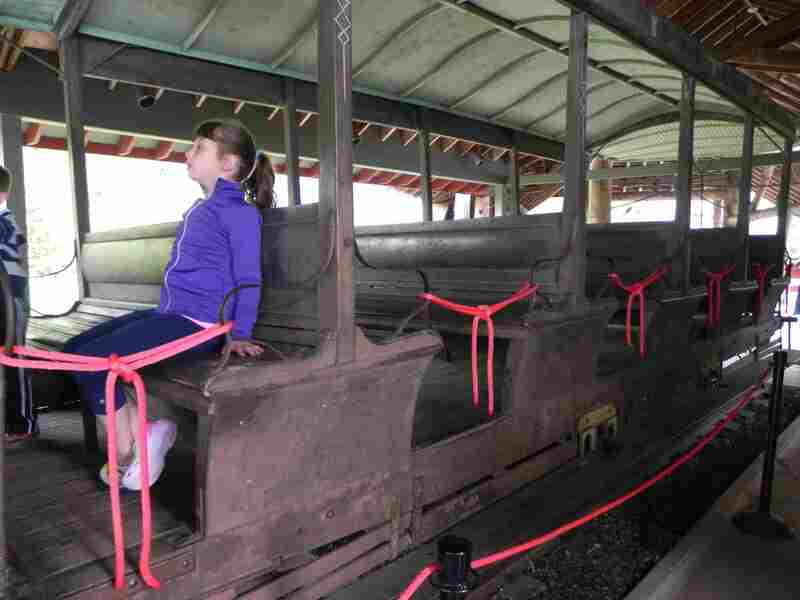 When it reaches the source of the Marion River passengers disembark and take a very short ride on a narrow gauge train that traverses Marion River Carry. Here is a depiction of the carry by the diorama. Diorama depiction of the Marion River Carry. 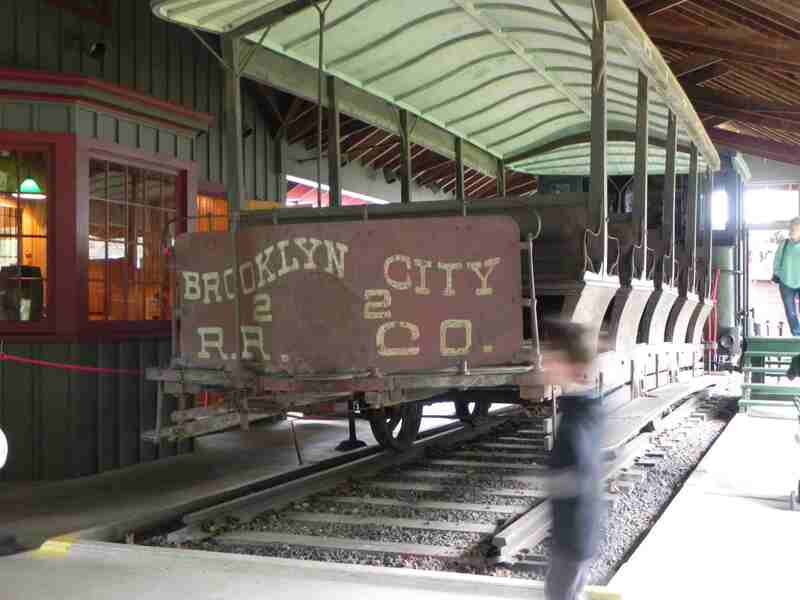 Fortunately, the narrow gauge train used on the carry was rescued after years of use and is now in the Marion River Pavilion at The Adirondack Museum. Here are some photos of her. Narrow Gauge locomotive used on the Marion River Carry. Rear of the Marion River Carry train. Before we leave the Kiloquah, here are some old photos of her. Steamboat Kiloquah with a guideboat on her upper deck and one in tow. Photo courtesy of The Adirondack Museum. On the far end of the Marion River Carry another steamboat, the Tuscarora, boards the travelers. 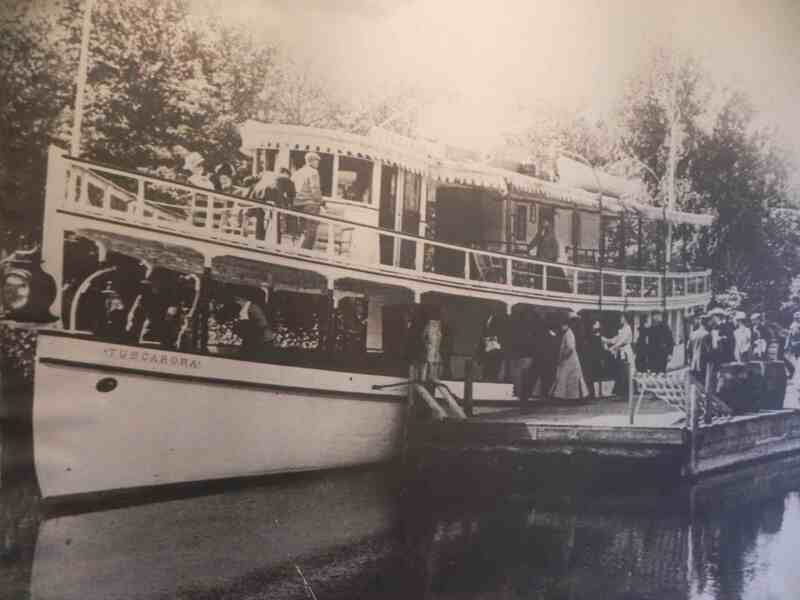 This steamer will traverse the Eckford Chain of lakes (Utowana and Eagle) before entering Blue Mountain Lake, its final destination. It will stop at several hosteleries including the Prospect House, the first hotel in America to have electric lights in every room. Below is an old photo of the Tuscarora. The steamboat Tuscarora at the east end of the Marion river Carry. The Tuscarora was bought by by a camp owner on Blue Mountain Lake. She was dry docked there and converted into a guest house. 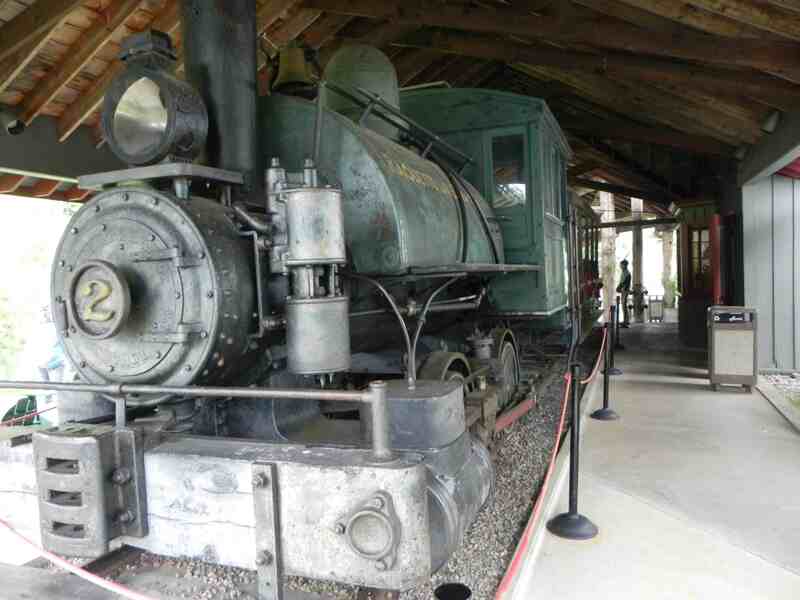 There was talk of restoring her and bringing her to the Adirondack Museum. However, it was felt that the expense to restore her was too great to justify doing so. As far as I know she is still in dry dock on Blue Mountain Lake. Here are two other steamers stopping at the Prospect House on Blue Mountain Lake. Note they both have guideboats on their upper decks. Steamers at the Prospect House on Blue Mountain Lake. We left the steamboat Sagamore at the train terminal at Raquette Lake. Remember, it had a green guideboat on its upper deck. 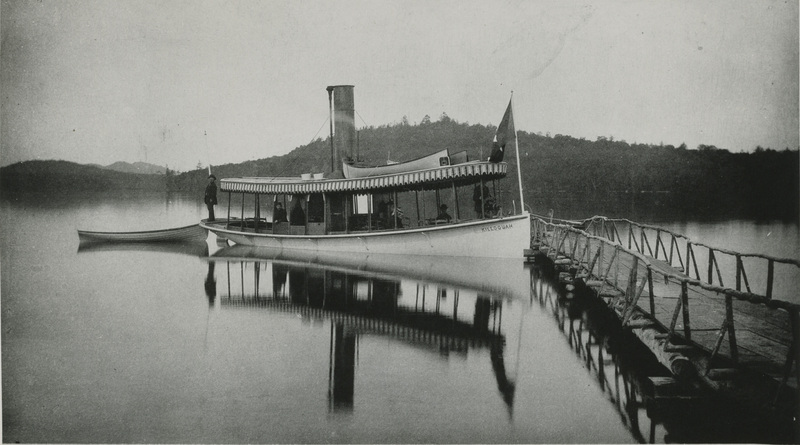 The Sagamore steams up into the north end of Raquette Lake. It must have stopped at various lodging places as well as the carry between Raquette Lake and its northern sister, Forked Lake (pronounced Fork Ed). Here is a clue as to why guideboats hung around with the steamboats. They must have been used as water taxis. Forked Lake provided access to Long Lake but there were no steamboats operating on Forked Lake. But a guide and his boat could row you down Forked to the carry around Buttermilk Falls and thence into Long Lake. So early on guides welcomed the advent of steamboats because it brought a new clientele. These travelers were more of the sightseeing type rather than sportsmen. But the relentless thrust of technology always causes disruption of old patterns and ways of making a living. We will see how this played out in an uprising by the guides as the steamboat encroached on the their livelihood.